There was only one shocker on "American Idol" on Thursday night (April 11): Amber Holcomb was in the bottom two. It was no surprise that last man standing Lazaro Arbos was on the chopping block again thanks to arguably the worst of his frequent bad nights in the finals. After what host Ryan Seacrest said were more than 34 million votes, Arbos tried to catch a ride on the final train to judge's save-ville. His decent, but not good enough swing at Nina Simon's "Feeling Good" almost redeemed what mentor Jimmy Iovine said earlier in the night was a pair of performances on Wednesday so boring they were like an "Ambien milkshake." But, alas, it was not to be and with his elimination, Arbos made history as the man who paved the way for the first-ever all female top five in "Idol" history. After half a decade of male winners, this year's champ is guaranteed to be a woman, a result producers all-but guaranteed thanks to the weakest field of male contestants in recent memory, who went down in an unprecedented 10-9-8-7-6 fashion. 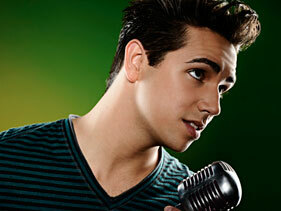 "Lazaro, we love you, you've been a treasure to the show," said Randy Jackson. "We've enjoyed you, but we're not going to use the save." With a smile on his face, Lazaro, whose inspirational story of a struggle to overcome a serious stutter kept him in the hearts of the judges, and America, longer than many had predicted, bid a quiet, reserved farewell. "OK. Sounds good," he said as time ran out for the episode. "No problem, guys."